The 5th verse explains about the condition of “deep sleep”, i.e., the state in which we don’t have any dream or, anything. Some says that when we are in a deep sleep state ; we are literally unconscious and nothing happens inside our mind ,even, dreams don’t exist and we are unaware of our surroundings and all sorts of feelings like happiness , sadness etc. For example -: let us take a car present right in front of us and because of the light reflected from the car come to our eyes , we are able to see that but, when the car will go away from our sight , we will be unable to see that car & this is very obvious . But, here we must understand that it the object of experience (in this case “car”) which is moved away from our sight and not the light. “Oh! I was in a deep sleep” or, “Oh! I slept like a log and I didn’t know anything “or, “I had a very peaceful sleep”. Now, question yourself -: If your consciousness has gone away then, what is the thing who let you know that you were in a deep sleep? The answer here is “Consciousness”. It the one and the same consciousness which is present in all the three stages, i.e., waking state, dreaming state & deep sleep state. According to the science of neural co-relation, in deep-sleep there is no consciousness. Feelings, thoughts, visualization of/about any object are taken as “consciousness of that object”, like, consciousness of a car or, laptop or, house etc. But, modern science hasn’t discovered “Pure consciousness” yet. According to Vedantic studies; what we are observing or, feeling or, thinking are “conscious events” which is in our mind or, in our experiences but, that which illumines all these conscious events is that one and the same “Pure consciousness”. In modern FMRI (Functional Magnetic Resonance Imaging) studies; neurons and their movements inside the brain etc. but, these are only “conscious events” and not the eternal pure consciousness. Now, here one may argue that-: Modern science has not yet discovered anything like “pure consciousness” while Vedantic studies argue that there exists only pure consciousness which is eternal. Then, how could one know that what Vedanta is telling is correct and in future may be scientists will be able to know about that “Pure consciousness”? Well, the answer itself lies in “deep sleep state”. Deep sleep is the condition where both Vedanta and Neural science agrees upon one thing and that is -: “There are no conscious events going on in the deep sleep state”. Now, here is the twist; if there is no consciousness then, what makes you say/feel that you slept like a log or, slept very peacefully or, you slept and there is just nothing/blank (No dreams or, anything) in your sleep. If there would be no consciousness then you might have been said -: “I was unconscious and I don’t know anything” or, “I don’t know anything and so much time elapsed” etc. But despite of all such things we often say-: "I went to bed then I saw a sweet dream and then I went to a dreamless deep sleep”. Now, even if we tell the words like ”unconscious” or, “don’t know how the time elapsed” but, intuitively we feel that -: whatever may be the state but I existed at that particular time and maybe there is no experience but, still that deep sleep make sense. For example-: In a completely dark room, we can’t able to see anything but, this doesn’t mean we lost our vision. 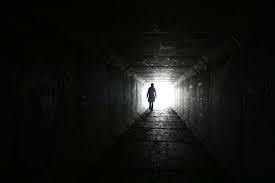 It is the absence of light that make us feel as if we are blind. Similarly, in deep sleep state, there are no conscious events to be illuminated by the pure consciousness and this never mean that “Pure consciousness is absent”. Pure consciousness is eternal and omnipresent. In the complete day exercise, i.e., the waking state, dreaming state and the deep sleep state; it is the one and the same consciousness that makes us aware. This process continues in the next day, next week and so on throughout our life. But, one thing is clear that there exist an unchanging consciousness which illumining all of our experiences. Months will come and go, years pass away and even life itself goes away; body dies and new body came up and even “Kalpa”, i.e., millions and millions of years will pass but, what remains unchanged is that eternal consciousness which acts as the witness of all such events. So many experiences come and go; consciousness watches. It is the one ever lasting and unchanging consciousness. This unchanging consciousness is our true identity. This is actually what we are because the body that we identify as ourselves is subject to change, i.e., from a toddler to an old person. Not only body, even our mind is subject to change, i.e., in old age people lost their memory and some people became mental patient in youth stage also; we forget things, and some lost all memories by an accident. The whole body and mind take rebirth after death and everything changes. Therefore, our thoughts, memories, perception, object of experience all are subject to change but, it is the consciousness which remains unchanged. Therefore, consciousness is our true identity and this is who we really are. This consciousness is called as “CHAITANYAM” or “CHIT”. Intrinsic property is the property which lasts with the object as long as the object lasts/exists and the moment the object is removed, the associated property also lost. Incidental property is something which is borrowed from something (maybe, from an object) and may be vanished instantly or, after some time irrespective of the existence of the object associated. 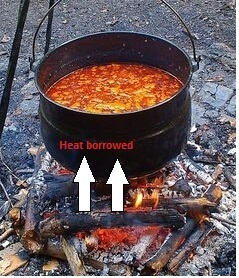 As you can see there is a pot (filled with water and vegetables) settled over fire. Here, the heat for the pot, water and vegetables is “incidental property” because the heat in the vegetables is borrowed from boiling water and the heat in the boiling water is borrowed from the heated pot which in turn borrows the heat from the fire underneath. So one all these objects (pot, water, vegetables) get detached from the objects through which they are getting heat the, with the passage of time they will start losing heat and eventually become cold. But, for fire, heat is an “intrinsic property” and it is not borrowed from anywhere else. Therefore, if we generate fire in the coolest place also, it is going to give us heat. Keeping this concept in mind; let us suppose that there is something with “Intrinsic existence” and “Things with borrowed existence”. Therefore, the thing with borrowed existence may lose the existence at some point of time; for example-: if we keep on writing with a chalk (on a black board) then at a point of time it will go out of existence and not only chalk but, everything that we see around us including feelings like happiness, sadness and memories etc. has “borrowed existence”. Now, imagine something with “Intrinsic existence”. If something will have “intrinsic existence” then, the object will become eternal and it will have no beginning and no end, i.e., time boundaries will cease to exist. This is what we discussed so far; the thing with this intrinsic existence is nothing but “Consciousness” or, “Chit”. In Vedanta, this “Intrinsic existence” is called as “SAT”.